Viticulture and winemaking in England and Wales boasts a long and rich history. From pre-Roman times to the present day, there has been winegrowing in Britain. These pages will outline a bit more about this long and fruitful history. Whether or not vines were grown and wine made in Britain before the arrival of the Romans is open to debate as there are no reliable records pointing one way or the other. Wine amphorae, dating from before the Roman conquest, have been discovered on sites in southern England, which could indicate that wine drinking was prevalent. This was probably adopted by the Belgae, who had established themselves in the east and south of Britain prior to the Roman invasion, and who had a liking for wine. The native Celts seem to have preferred beer and mead, which used local indigenous ingredients. Archaeological discoveries from that time include a 4′ high Roman amphora and a silver wine cup, both recovered from the British tombs of Belgic Chieftains of the 1st Century BC. Strong trading links with France and Italy allowed wine to be imported relatively easily and it would therefore seem unlikely that there was any need to establish vineyards in this country. It is generally agreed that the Romans introduced the vine to Britain. It has also been inferred that the climate in Britain at that time was warmer. At the end of the first century AD, however, the writer Tacitus declared that our climate was “objectionable”, and not at all suitable for growing vines, which could suggest that someone had at least tried to establish vines, even if they had been unsuccessful. 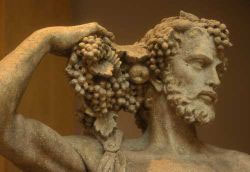 The Romans liked their wine – whether home grown or imported. 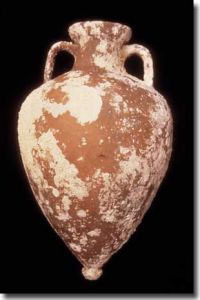 After invading Britain in AD 43, wine drinking became more commonplace and whenever Roman villas, houses and garrisons have been excavated, there is nearly always archaeological evidence of wine amphorae and drinking cups, and occasionally grape pips and stems of bunches of grapes. By the time the Romans began to leave at the end of the fourth century, Christianity became more widespread and wine drinking, playing as it did an important part in Christian ceremonies, was more accepted. Whether this was of local or imported wine, it is hard to say. If there were vineyards, then they were undoubtedly attached to religious institutions such as monasteries. The Dark Ages followed the Romans. Invasions by the Jutes, the Angles and the Saxons destroyed much of the limited civilisation that the Romans had established during their 300 years of occupation. These warring tribes neither had the time nor the inclination to settle down and set up vineyards, and whatever vineyards there had been undoubtedly became neglected. The early Christians, fleeing from these tribal disturbances, retreated to the corners of these islands, in many cases settling in areas that were unsuitable for vineyards. With the spread of Christianity in the sixth century to the south and east of the county, old skills were revived and there is some evidence that vineyards were established. However, trade with mainland Europe also increased, including that in wine, which is well documented, and vinegrowing in this country would therefore have been limited. The Viking invasion in the late eighth century destroyed many monasteries and with that once again vinegrowing and winemaking skills were lost. King Alfred, who defeated the Danes in the late ninth century, helped re-establish the Christian religion, and in doing so, undoubtedly encouraged the revival of viticulture. By the 10th century, vineyards did exist and wine was made. Documentary evidence from that time indicates that there were vineyards attached to monasteries, particularly in the West country and Central south regions. 1066 marked the start of an era of viticultural activity that would not be matched until the current revival which began some 900 years later. With William the Conqueror came French Abbots and their monks who were experienced in winegrowing, along with soldiers and courtiers for whom wine was a daily requirement. The Domesday Book (1085-6) records vineyards in forty-two definite locations. Interestingly enough only twelve of the Domesday vineyards were attached to monasteries. Most belonged to nobles and were undoubtedly cultivated to provide them with wine for their dining tables and altars. There were two main areas of monastic viticulture: the coastal areas of the South East, and the area covering Somerset, Gloucestershire, Herefordshire and Worcestershire. Many sources point out that the climate improved for a period of 300 years starting from about the time of the Norman invasion and citing this as a reason why so many vineyards were planted. The wines made at this time were probably all consumed during the cooler weather of the winter and spring following the harvest and in any event, well before the weather warmed up which would have caused the wine to oxidize, spoil and turn to vinegar. Imported wines, of which there appeared to be no shortage, also suffered from the same problems – at least home produced wine did not have to travel far and probably suffered less than imported wines from oxidation, thus partially explaining its apparent popularity. This long 600 year period marks change and gradual decline in English and Welsh viticulture. Why it did not really become a viable alternative to other crops, as it did in other countries where monastic viticulture was common, is open to debate, but commercial and practical considerations have to be important. Before the Black Death arrived, the religious orders had prospered, reliant upon a pliable and available workforce. However, finding their manpower depleted by the plague, they took to leasing their land, rather than working it themselves and their new tenants, dependent upon short-term cash crops to pay the rent, did not want to grow vines, which then, as now, can only be grown on a long-term basis. The Black Death itself, which lasted from 1348 until the 1370s, not only cut the population dramatically, but forced changes in agriculture which had far-reaching social and demographic effects. 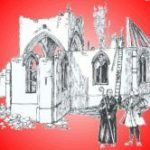 Although the Dissolution of the Monasteries in 1536 is often cited as being the single event that destroyed winegrowing and winemaking in England, it would appear that by this time, many monasteries had given up. The new landowners who had been handed these religious assets, proved reluctant to indulge in viticulture. It is also said that the British climate underwent some change at this time, becoming generally wetter, with cooler summers and milder winters, leading to less ripe grapes and more fungal diseases, both of which would have been disincentives to profitable winemaking. Wine had been coming into the country from Bordeaux since Henry II (1154–89) became King of England. Transport conditions and speeds improved and the importation of wine (and other goods) became cheaper. Also, as techniques of preserving wine for long journeys improved, imported wines arrived in better condition. Home produced wines faced, as they do today, considerable competition from imported wines. From the mid-1300s, Great Britain became renowned for its expertise in selecting, importing, bottling and cellaring wine and much of the finest wine came into ports like London, Bristol and Leith. Wines such as Claret, Port, Madeira, Sherry, Hock and Mosel were, if not invented, then refined, nurtured and made more famous by their association with Britain. With these disadvantages, it is perhaps not surprising that commercial viticulture suffered and vineyard owners, unless they were prepared to support their efforts out of funds from other sources, found more profitable uses for their land. However, despite these problems, vineyards were planted and wines were made. There are records of some vineyards in the 17th century. The great botanist John Tradescant planted 20,000 vines on his employer Lord Salisbury’s estate in Hertfordshire and the vineyards became well-renowned. In 1666, John Rose, Gardener to Charles II at His Royal Garden in St. James’s, wrote a treatise on the cultivation of vines in this country called “The English Vineyard Vindicated”, in which he discussed the question of site selection, vine varieties, pruning and training and care of the vines up to the harvest. One of the most famous vineyards of this era was that at Painshill Place, Cobham, Surrey, which was planted by the Hon Charles Hamilton in 1740, who was clearly ahead of his time. The property still has a producing vineyard to this day. Painshill’s vineyard however died out at the end of the 1800s and although there were others, the story was much the same. After the initial enthusiasm of the owners (mainly gentlemen of property and considerable income), the uncertainty of the climate and the variability of the crops in terms of both quality and quantity took their toll and the vineyards were abandoned. Tastes and fashions in wines also changed. Sweet, heavy, fortified wines from Australia and South Africa were popular at that time and home-grown wines could never match these. The last great experiment into commercial viticulture – that is before the start of the modern revival – was that of Lord Bute at Castel Coch (which is its Welsh name – it is more usually called Castle Coch). The third Marquess of Bute was a wealthy landowner and industrialist, who had the wherewithal to indulge his visions and fantasies. In 1873 he sent his head gardener, Mr. Andrew Pettigrew, to France to see how vines should be grown. Following his visit, vines were ordered and in 1875 three acres were planted at the castle. Over the next 35 years, the original site was expanded and a further two sites were planted and in the end totalled over 11 acres. The Marquess died in 1900 and was succeeded by his 19 year old son, who was equally as enthusiastic. Pettigrew was himself succeeded by his own son (also called Andrew) who continued his father’s work. 1911 appears to have been the last successful vintage and the vineyard was grubbed up, just after the First World War, in 1920. It was not until the 1950’s when new vineyards were planted and the modern commercial wine industry was born. The revival had to wait for the arrival of pioneers who wanted to disprove the theory that wine could not be made from grapes grown outside in our climate. A combination of new varieties, more suitable growing techniques, better disease control and an acceptance by the public of the style of wines that those varieties produced, were the key elements in that revival. There are 3 individuals who, in their own ways, brought about the start of the revival which lead to the planting, in 1951, of the first commercial vineyard of modern times at Hambledon in Hampshire. They were Ray Barrington Brock, Edward Hyams and George Ordish. Ray Barrington Brock must be considered as one of the founding fathers – if not the founding father – of the revival in wine production in the British Isles. Brock established a research station at Oxted in Surrey, where he trialled some 600 different table and wine grape varieties over the 25 years of the station’s life. Through obtaining grapevines and vine cuttings from universities and viticultural research stations in the major winegrowing countries of Europe (including Hungary) as well as Russia and various parts of the United States, he built up a collection of grape varieties that were to become the backbone of the early English and Welsh wine industry: He introduced both Müller-Thurgau (then called Riesling Sylvaner) and Seyve Villard 5/276 (Seyval blanc) to the UK. Brock also built a winery in which he experimented with methods of winemaking to suit those grape varieties that were growing well. To improve his winemaking skills, Brock made contact with various institutions and organizations. This included sourcing the right yeast cultures to suit the winemaking practices being employed. There was no doubt that his enterprise created a lot of good will and people were intrigued to see how English and Welsh viticulture would develop. Brock also published books on the subject and sold vines from the nursery bed he created at Oxted. Many of the earliest vineyards to be planted (Beaulieu, Horam Manor, Elmham Park, Felsted and Yearlstone) obtained vines from him. Ray Brock’s work on vines must be seen as really quite remarkable. That he should decide to establish a private research station to study a crop that did not have a natural home in our climate is quite a feat in itself; that he should do so with such effort, energy and diligence for little or no personal gain, apart from the satisfaction of seeing it done properly, is another matter. In retrospect the site he chose could have been better – nearer to sea level and less exposed – and undoubtedly this would have resulted in riper grapes and better wine. He always countered this by saying that he felt comfortable in recommending a variety that had performed well at Oxted, knowing that it would therefore ripen in almost any site in the south of the country. The legacy of the Oxted Viticultural Research Station is to be seen in today’s English and Welsh wine industry. He lived to see an industry that was slowly gaining recognition. He died in February 1999, aged 91. Edward Hyams, who first appears in the Oxted story at the harvest in 1949, shares with Brock the honour of being one of the fathers of the viticultural revival. Through his extensive writing and speaking he did much to publicise the subject and make the public aware that the revival was under way. In 1946, Hyams was de-mobbed from the Royal Navy and he and his wife returned to Kent. They planted some vines for table and wine, and contacted likely sources for suitable varieties, including some of the same institutions and nurseries that Brock was in touch with, and ended up with some of the same varieties, which were planted in 1947 and 1948. Hyams collaborated with Brock, and also went searching for old varieties already growing in Britain and through an appeal in one of his many articles, discovered a vine growing on a cottage wall at Wrotham in Kent. In appearance it resembled Pinot Meunier and was therefore named Wrotham Pinot. Cuttings were taken and propagated at Oxted. When compared to supplies of Pinot Meunier from France, Brock recorded that Wrotham Pinot had a higher natural sugar content and ripened two weeks earlier. Hyams greatest contribution to the advancement of viticulture was undoubtedly the massive amount of publicity he created through his writing and broadcasting. His first book was published in 1949, called ‘The Grape Vine in England’, with a forward by Vita Sackville-West. This book marked a milestone in the early years of the revival. It was, and remains to this day, a scholarly work on the subject and contains chapters on the history of the grapevine in England, the work of Brock at Oxted and the cultivation of the vine and winemaking. In 1953 Hyams edited ‘Vineyards in England’ – a masterly work of 20 chapters, many written by different specialists, covering every conceivable aspect of grape production in the British Isles. The book stands today as one of the most important for anyone contemplating growing vines in England or Wales and despite being over 45 years old, much of it, apart from the choice of varieties, remains relevant. One of his last articles before his death in 1977 cited that “there is no doubt that English vineyards in the right places can produce fine white wines, and that such wine should be the object of English viticulture”. By then of course the revival – for which he was in no small part responsible for instigating – was well under way. George Ordish was by training an entomologist and economist, working on horticultural problems in Europe, Latin America and Africa and took a keen interest in the pests and diseases – those that caused the greatest damage both environmentally and economically and about which he also wrote in detail. One of his first jobs was as an entomologist working in the Champagne region. On returning to his native Kent he was struck by the similarity in the climates and by the differences in the landscape. After local research revealed that England had a history of viticulture, he resolved to see whether he could get grapes to flourish and ripen and, in 1938, planted a few suitable vines in his garden near Maidstone. Ordish proved to be an accomplished winemaker and he soon saw that good wines could be made from English grown, outdoor fruit. His trial vineyard had proved that grapes would ripen in our climate and these trials prompted his first book on the subject, ‘Wine Growing in England’ which appeared in 1953. This book, which came out in the same year as Hyams’s second book on the subject, drew on many of the same sources. Ordish had also been in contact with Ray Brock and had visited Oxted on more than one occasion. One notable inclusion in Ordish’s book is the chapter where he sets out the costs and returns from an acre of grapes. The book was yet another medium of publicity for the revival of winegrowing in Great Britain and helped spread the word. 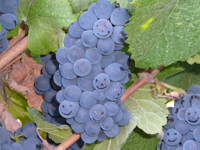 It certainly helped add to the number of people in the country who looked on outdoor grapegrowing as a possibility. Ordish went on to write two further books concerning viticulture. He died in 1990. Between them, Ray Brock, Edward Hyams and George Ordish had questioned why it was that outdoor viticulture in the British Isles had all but died out and had, to acertain extent, shown how it might be revived. Although they had not discovered all the answers, they had, through a combination of practical demonstration, scientific research and publicity, generated sufficient enthusiasm for those with the inclination to, to start planting vineyards. 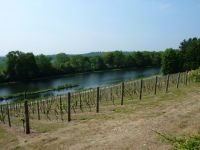 The first modern vineyard, Hambledon in Hampshire, planted in 1951, was the tangible evidence that the revival was underway. The planting of the vineyard in 1951 at Hambledon in Hampshire by Major-General Sir Guy Salisbury-Jones GCVO, CMG, CBE, MC DL marked a turning point in the history of winegrowing in Great Britain. This was the first vineyard to be planted specifically to produce wine for sale since Castle Coch in 1875. Seyval Blanc was planted on a one acre site, following a visit by Salisbury-Jones to Oxted, which grew well and produced their first crop in 1954. The wine caused much publicity and Salisbury-Jones was besieged by the press and media interest. The name ‘Hambledon’ soon became synonymous with English Wine. The vineyard has just been revived and replanted (this time with the three traditional Champagne varieties), so in time the name will soon be recognised again. The expansion of vineyards after the planting of Hambledon was painfully slow. The Merrydown Wine Company at Horam in East Sussex, owned by Jack Ward, planted 2 acres in 1955, and became the second commercial vineyard of the revival. Müller-Thurgau was planted, amongst other varieties. In later years, Ward became instrumental in introducing varieties such as Reichensteiner, Huxelrebe and Schönburger to the UK. He was very much a driving force in the industry and was the English Vineyards Association’s (now UK Vineyards Association) first Chairman. 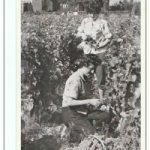 The third vineyard to be planted was in 1957 by Lieutenant-Colonel Robert and Mrs. Margaret Gore-Browne at Beaulieu, in Hampshire, which by 1960 expanded to almost 5 acres. The highest accolade to be awarded in the UK’s annual national competition is named ’The Gore-Browne Trophy and awarded for ‘Wine of the Year’. Winemaking in those early days was, from all accounts, a fairly hit and miss affair. Both Salisbury-Jones and Gore-Browne built their own wineries and enlisted the help from Anton Massel, a young German who had come across to work for the Seitz Filter company and eventually opened his own laboratory. Massel introduced a number of modern winemaking practices, and better equipment. The real expansion of vineyards in England and Wales started in the early to mid-1960s. Vineyards spread across the country, with new sites, training and pruning systems and above all, grape varieties introduced. The development of the industry had begun. The real expansion of the vineyard area and the establishment of both sizeable vineyards and wineries started in earnest in the late 1960s and early 1970s. One of the features of English and Welsh viticulture is the diversity of backgrounds of those who plant vineyards. In other countries where new vineyards are being planted, one would expect to see existing landowners – most usually those with land in the vicinity of established vineyards – planting up, together with a smaller number of entrants with no experience of growing at all, but with serious funds, usually made in a completely unrelated industry. In the UK, those planting vineyards come from a much wide cross-section of the community. The years between 1976 and 1995 saw a large number of vineyards planted, including some very sizeable ones, and since 2000 has seen a year on year rise in plantings which continues. Plantings in recent years have not been quite so frenzied and the rate of new plantings has certainly declined. Several factors are responsible. A rumoured vine planting ban in 1990/91 persuaded many growers that if they were going to plant it had better be soon and between 1992 and 1994 an abnormally large number of vines were planted. Of course, not all vineyards planted since 1951 in England and Wales have survived. Some vineyards disappeared through natural causes such as retirement, divorce and death. Vineyards which for whatever reason could not produce sufficient quality and/or quantity of wine to make the enterprise viable have been grubbed out, leaving those capable of producing commercially acceptable wines. Today, there are vineyards in nearly every county of England and Wales, and there are vines now planted in Scotland. Much of the acreage and vineyards lie in the southern part of England, and more specifically Kent, Sussex, Surrey and Hampshire. Those few hundred acres first planted has now grown to over 5,000. In the last ten years alone, the acreage planted has more than doubled, and nearly tripled since 2000. Last year, around 1 million vines were planted – the highest planting in a single year, and perhaps a higher volume is set to be planted in 2018. All of this will lead to some substantial increases in production. 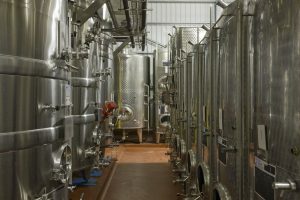 The wine industry of Great Britain is now attracting considerable investment, boasts many wineries with the state-of-the-art facilities you will see anywhere else in the world. Indeed, two Champagne Houses have now invested in land in Southern England: Taittinger and Vranken Pommery. The nature of the wine business in the UK varies. Some vineyards have bypassed the challenge to produce their own wines and concentrate on growing grapes to sell on to other, mainly larger concerns. Some owners have leased their vineyards to other wine producers, thus reducing the overall number of players in the market. One growth area in the industry is tourism: vineyards are opening their doors to visitors together with a wide range of facilities. This is set to develop even further over the next years, recognising the contribution tourism is making to the rural economy. As English and Welsh wine exports continue to flourish, so the message about visiting our vineyards will grow further. Last year (2017) the industry started a new chapter in its history, by creating a new industry body, Wines of Great Britain (WineGB), formed of the merger of the existing operations (United Kingdom Vineyards Association and English Wine Producers). WineGB not only reflects the new confidence from the industry itself, but united will provide more opportunities to promote further awareness in the vineyards and wines of this country.